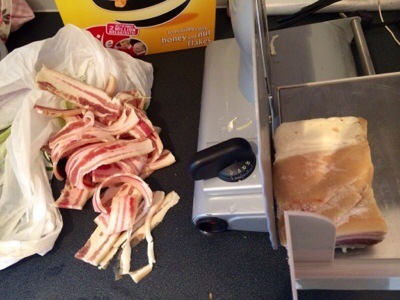 Home › Breakfasts › Makin bacon..
Whatever the cut just make sure it’s from a great hog.. It may seem a little pricey at the time yet have a think about his great it’s gonna be.. And when sliced up you will be astounded and amazed..( jeez I sound like some kinda circus guy!).. At the amount you get..
Ok that’s it! Thems the rules.. 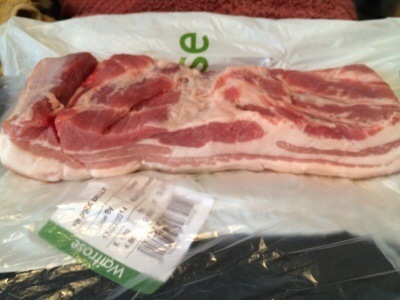 This time for me it’s belly.. Berkshire sired belly.. Just bought straight up from the butchers counter.. Many many recipes .. Techniques and sheer bafflement.. 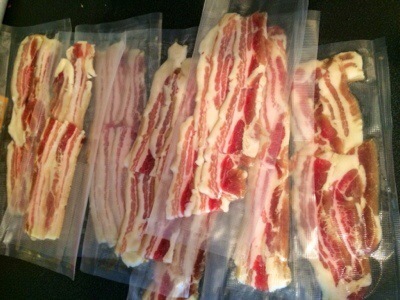 I go easy .. Just get on line and order some bacon curing mix.. It’s all natural so don’t worry about any hidden nasties.. Maybe I will start to make my own cure yet for now this just makes it easy.. And easy is good right? 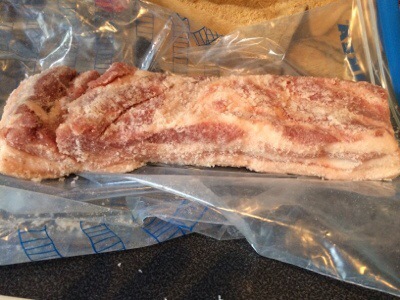 Simply run the cure all over the pork… Into all the cracks .. And put it in a bag.. Into the fridge..Is that it? Turn it every day.. Makes it easy when it’s in the fridge.. When you first open the fridge in the morning just flip the bag..
One day per half inch, thickness if meat.. Plus two more days at the end..
At the end of time rinse the meat..
Leave it one more night uncovered in the fridge. Now you can get all scientific if you like.. Smoking it an all that .. I simply run it through the sliced and vac pac it up..
No need really as now it’s cured you could just hang it up.. It leave in the fridge till it goes frazzy.. Doubt it will last that long though..
Trust me .. You will NEVER go back to overpriced nor under whelming bacon again.. NEVER!! You really do… am thinking also of mutton bacon.. Macon.. Seriously? It’s that easy? I’m totally going to have to do this! 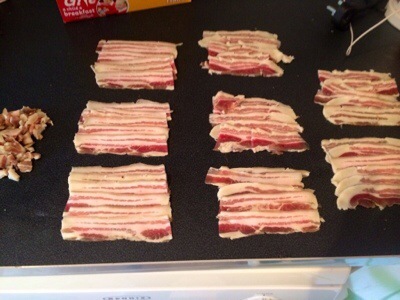 I love bacon but don’t get it that much because of all the nitrites and crap… this could change everything. You’re my hero, Mr Fitz, making your own bacon and all. I don’t think I would take the time to ever do that. I usually get turkey bacon anyway which leave no mess at all in the pan.